Almighty God, whose blessed Son took our human nature so that we might regain our lost innocence and be restored to the divine image that was disfigured by sin, grant that as we meditate on the mystery of his humanity we may share the glory of his divinity, who lives and reigns in the unity of the Holy Trinity, Father, Son, and Holy Spirit, now and forever. V: We adore thee O Christ and we bless thee. R: Because by thy wonderful Nativity thou hast given us new birth. The “wise men” have been subject to more legendary additions than any other part of the Nativity story. 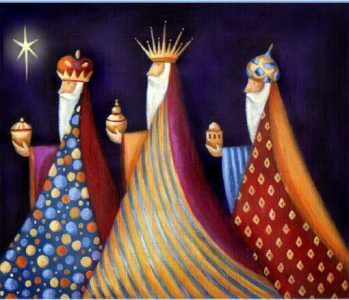 They have been given names and described as kings, but the Greek word in the gospel is magi, which was widely used of those who practiced magic and divination. These men may have come from anywhere in the Middle East region: the point of the story is that they were the first Gentiles to visit and worship the Christ Child, offering him gifts which relate to his kingship, priesthood, and sacrificial death. We give thanks that the Incarnation was for all people; that God makes a new covenant with any who will come to him in faith. We ask for grace to offer our gifts of love and obedience. They are all that we can give him, but he graciously accepts them if they are offered in the name of Jesus. May we be watchful for his many ways of guiding us, and joyful to follow them. Although we have learned and experienced so much of the steadfast love of God, we are still hesitant in following where he leads, as the Magi followed his guiding star. We do not make ourselves open to his calling, and we are grudging in our response. Help us to seek diligently after his will and to make our lives richer in worship. V: God sent his Son into the world. R: To bring us to eternal life. Gold for a king, for the King of the Jews, and King of all the Earth, for he made it: stoop under the low lintel of humility, to fall before him throned in a cradle. Incense for a priest, for the High Priest of the Covenant, rising over the sacrifices that unite divine and human: these rough walls contain the Holy of Holies, where all may enter into a greater Covenant..
Myrrh for the dead, for those whose life returns to the Giver, yielding the breath that was granted for a span of years: learn from this Child that the cradle leads to the tomb, but the anointed body is not the end of the story. Mary and Joseph wonder at the strange visitors who are brought to their knees before their loved fragility; not yet knowing of the royal title to be nailed over the priestly sacrifice, silent in death. to the life beyond death. A hymn may be sung: see above. A priest who is present may give this blessing, or the people may say it together, saying, us, for, you. May God give you grace to follow the example of Christ, and bring you through the power of his Incarnation to eternal life, and the blessing of God Almighty, the Father, the Son, and the Holy Spirit, be among you and remain with you always.